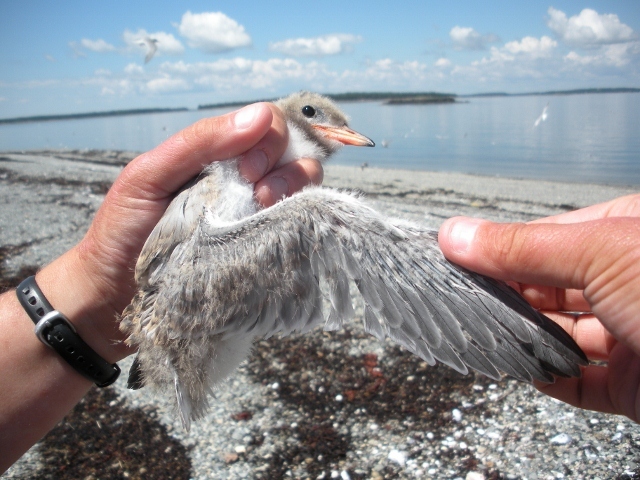 And now what we’ve all been waiting for (at all of us on Ship Island): tern chicks! After a few hours in the sun, the chicks dry out and become balls of fluff and feet. In less than a day, they can already make their way a short into the vegetation to hide. 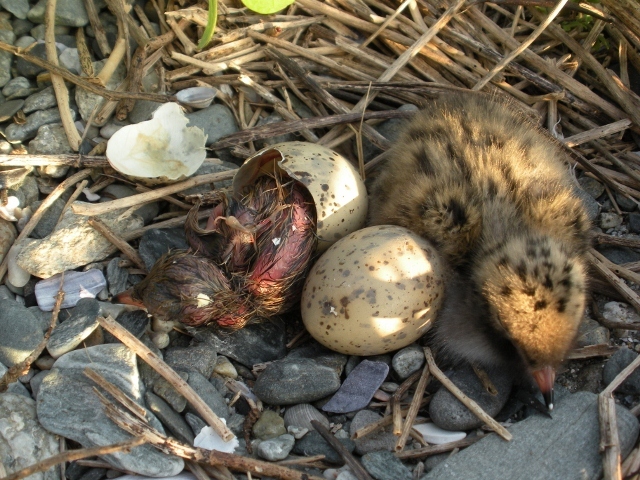 Tern nests are very simple and don’t offer a lot of shelter, so it’s important for chicks to get out of the nest as soon as possible. One in the vegetation, their natural camouflage kicks in and they become very difficult to spot. 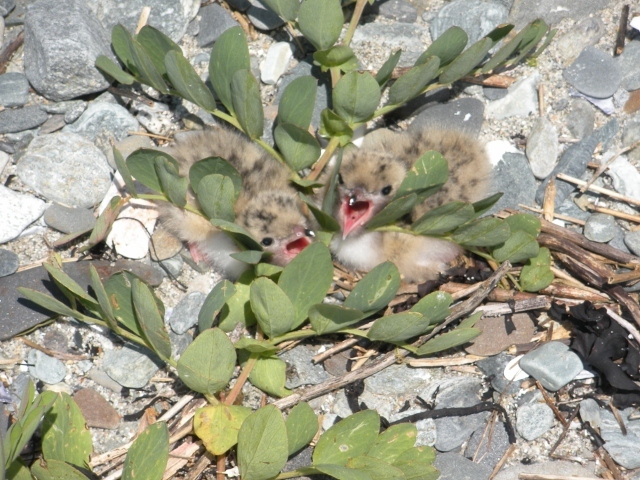 For the next two and a half weeks, tern chicks spend their lives hiding in the vegetation and waiting for their parents to return with food. 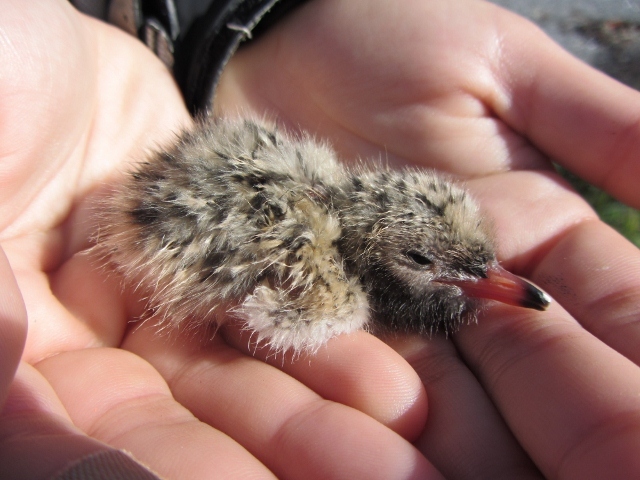 They have a lot of growing to do: a newly hatched chick weighs about 15 grams, while an adult tern will weigh as much as 145 grams. Chicks also have to grow a full set of flight feathers to replace their polka-dotted down. Fabio just reached 15 days of age, and his primaries (the long feathers at the tips of the wings) are really starting to grow! In less than a week, he should be flying around with his parents and learning to catch his own food. Hello again! As many of you may now know today, June 27th, is guillemot appreciation day. 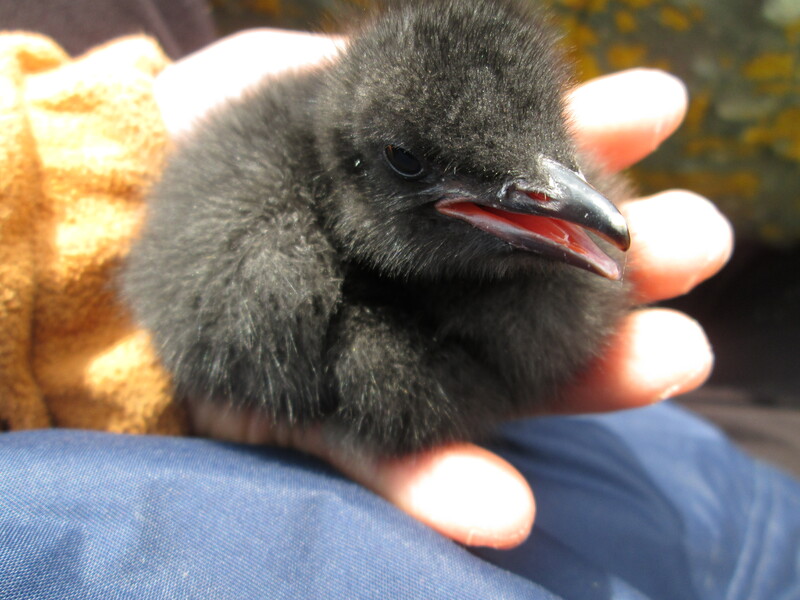 This day holds a special meaning for us on the Brother’s, not just because it is the perfect excuse to eat chocolate cake, but also because three days ago we found our very first black guillemot chicks of the season. Guillemot eggs do not usually hatch at the same time. Even eggs in the same burrow may be a day or two apart. The chick that hatches first is referred to as the A chick and is typically larger and heavier than the B chick. 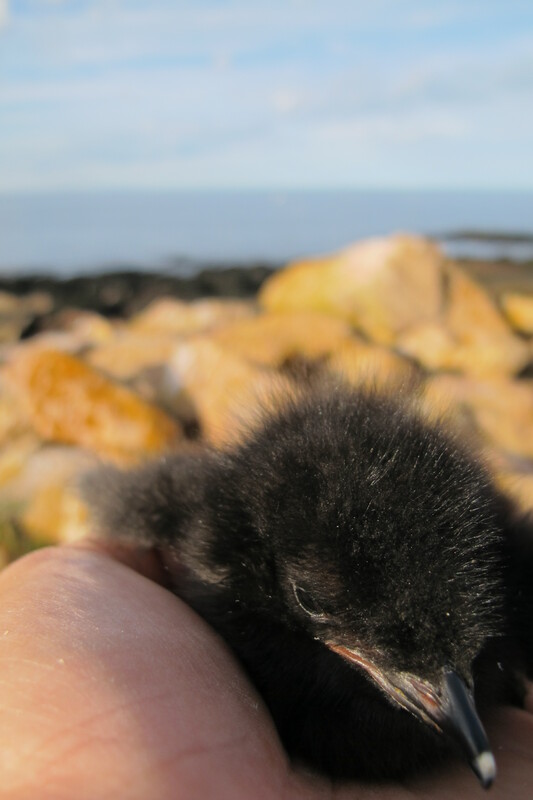 As part of our routine on the Brother’s we check guillemot burrows every two to three days. As the chicks are now beginning to hatch we will be measuring their wing cords and taking their weight during our checks to monitor their growth. At the end of the season these measurements will help us to determine the guillemot’s productivity. Our first A chick, Albert, weighed in today at a whopping 63g! Our B chick, Bathalamue, came in at a slightly more modest 57g. In order to continue to tell the chicks apart in their burrow as they grow we must somehow mark either one or both of the chicks. At this stage a small dab of nail polish on the A chicks down does the job quite nicely. Later on we may replace the nail polish with a more permanent metal band with an identification number around their leg so they can continue to be recognized in years to come. Albert, looking for a fight! Even though they are only a few days old Albert and Bathalamue have very distinctive personalities. Bathalamue is quite calm and lets us take our measurements without a fuss. Albert on the other hand is quite feisty and full of sass. From the moment we first pulled him out of the burrow he was a rage filled ball of fluff trying to snap at our fingers with his tiny black bill. We found one new pair of chicks today and look forward to the next few weeks as still more will continue to hatch. We certainly appreciated our guillemots today and we hope you do the same! Adult Black Guillemot foraging near shore at Petit Manan Island. We often see them carrying rock gunnel (a red eel-looking fish) in their bills. As you glance at a calendar organizing your plans for the rest of a glorious Maine Summer, it might escape your attention that today is a very special day. Today is International Guillemot Appreciation Day!! The predominant object of our daily attention here on Petit Manan is the tern colony and with just under 2,000 nest sites this year they do keep us busy. In honor of the many other avian residents that call PMI their breeding home, we are very happy to honor this internationally recognized day specifically for this alcid. Maine is the tip of their southern range, so we are the only state in the lower 48 to host them. 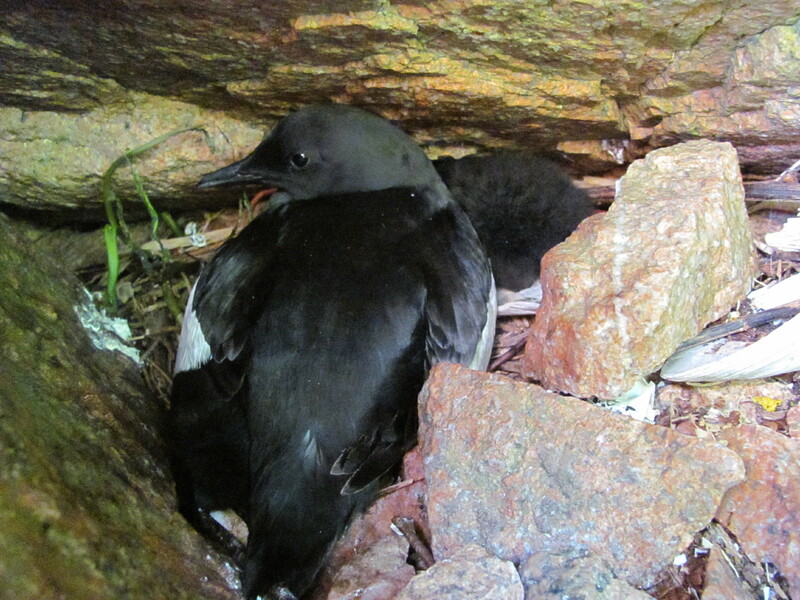 We have noted over 50 Black Guillemot nests here on the island and some chicks have begun to hatch. Many mornings, during our twice daily lighthouse survey, we count more than 200 of them in the waters surrounding the island, paddling around with their bright red feet. 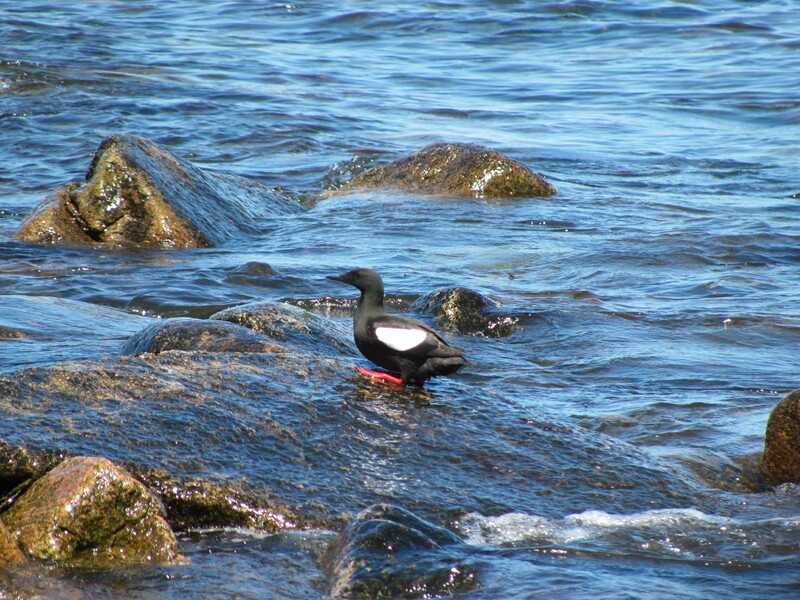 Happy Guillemot Appreciation day to our feathered friends here in the Gulf of Maine! 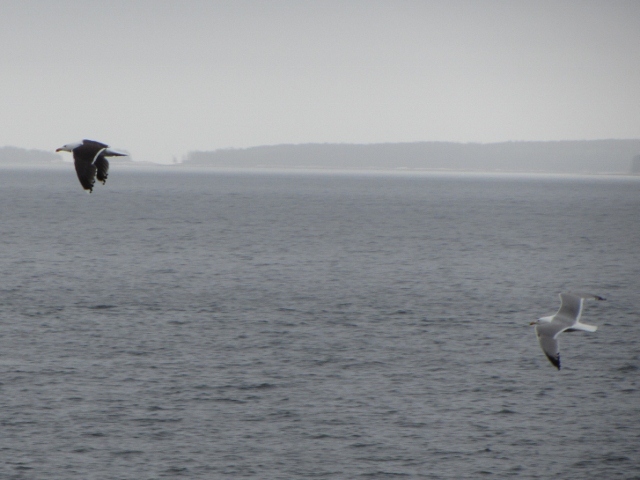 During the first few weeks of the seabird field season the number of avian residents on Petit Manan is relatively low. Just two field technicians anxiously awaiting the arrival of a seabird colony. And then it happens, slowly at first but with increasing momentum, the nesting residents begin to descend from the sky until there is a frenzy of feathers everywhere you look or try to step. In order to gain an accurate estimate of such a large volume of birds we perform an annual island wide census. In order to perform that we call in reinforcements. This year we were lucky enough to gather 13 people with representatives from U.S. 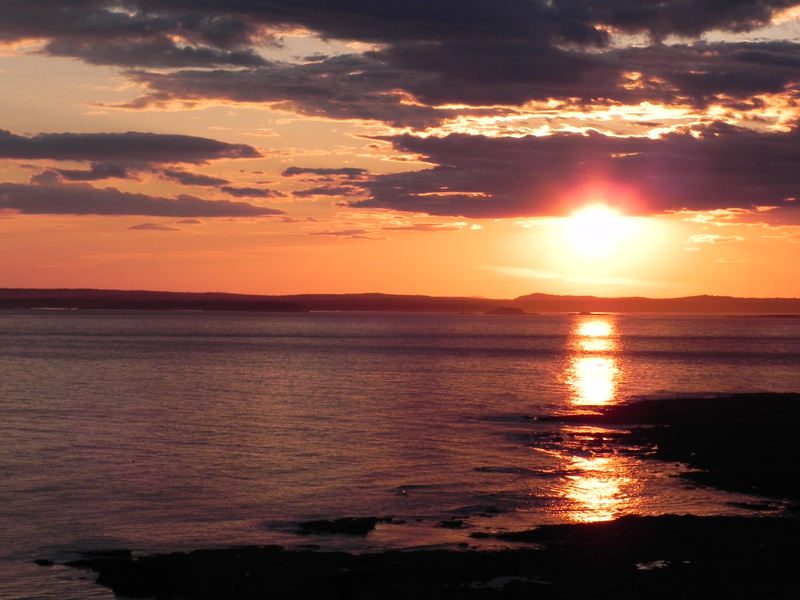 Fish and Wildlife Service, Acadia National Park, Schoodic Education and Research Center, Student Conservation Association and the University of Maine. 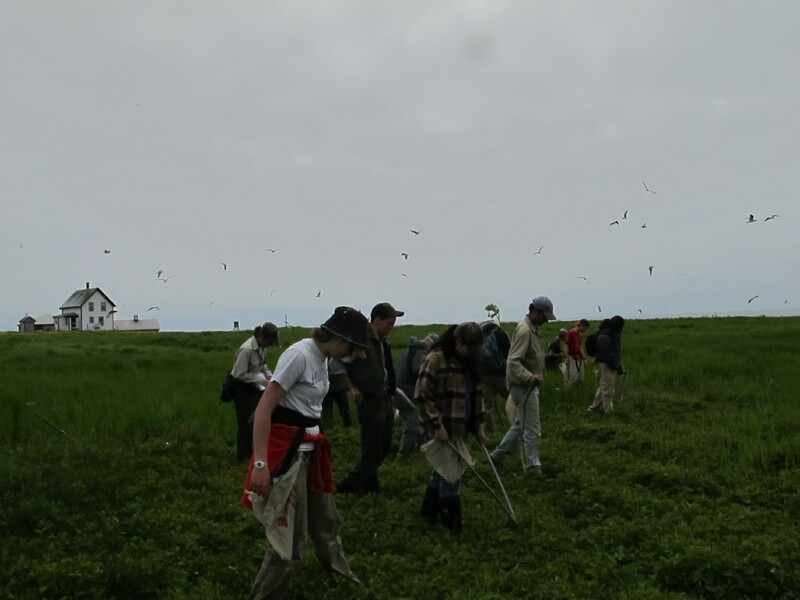 The census line scours the vegetation for nests of terns, eiders and laughing gulls. In a straight (ish) line we walk shoulder to shoulder back and forth marking each nest site across the entire island. Each step needs to be carefully calculated to avoid cryptically camouflaged eggs. The process is made even more nerve-racking by the dive-bombing terns screeching an alarm call to alert their neighbors of your intruding presence in the colony. After two days of counting, the census numbers are in!! For the final nesting numbers of alcids (puffins, razorbills and guillemots) you will have to wait until early July, so check back. 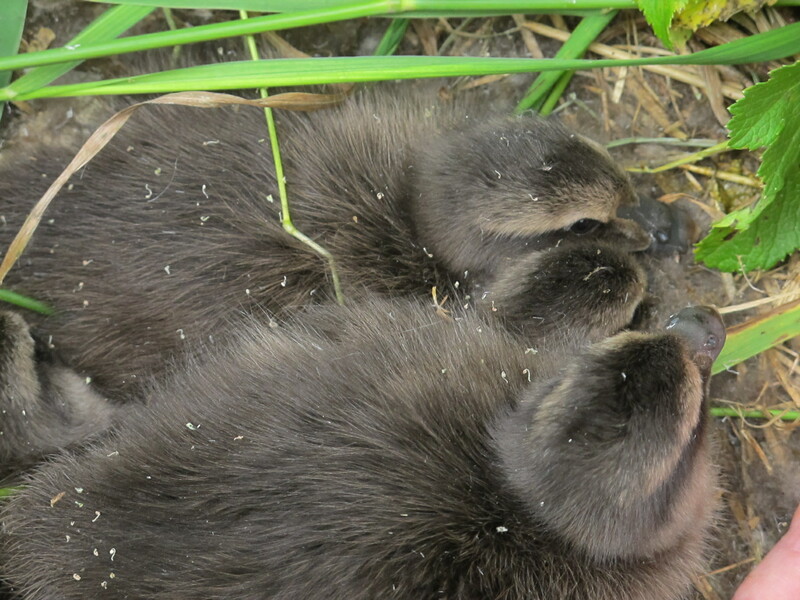 Three eider ducklings found at one of the nest sites. Within 24 hours of hatching, their mother hen will take them down to the water’s edge to begin their life at sea. 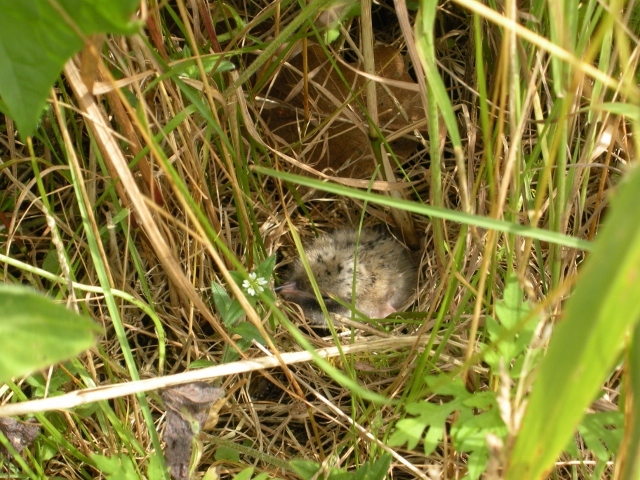 Check back to see the hatching and success rates of the many Petit Manan residents. Thank you to all of you who helped with this year’s census! Hello again from Ship Island! Jill and I have been off the island for about 4 days as part of a mid-season break provided for us by the refuge staff. Now that we’re back and catching up on our work, here’s the second part of “Citizens of Ship Island”, as promised. In my last post, I wrote about the songbirds that call Ship Island home during the summer. This time, it’s all about water birds of all kinds. While we have songbirds breeding right on the island, most of our seabirds and shorebirds are found on the three islands surround Ship: East Barge, West Barge, and Trumpet. Take for example the Great Black-backed and Herring Gulls. 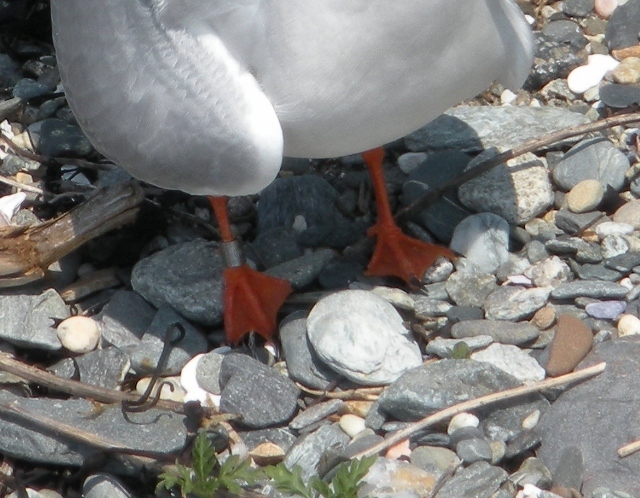 Because both of these species of gulls will eat tern eggs and chicks, they aren’t permitted to breed on Ship itself. Both species, however, make (usually unwelcome) appearances on Ship and have nests on both the Barges and Trumpet. Great Black-backed Gulls are one of the biggest North American gulls, with a wing span of over 6 feet while Herring Gulls are a bit smaller. 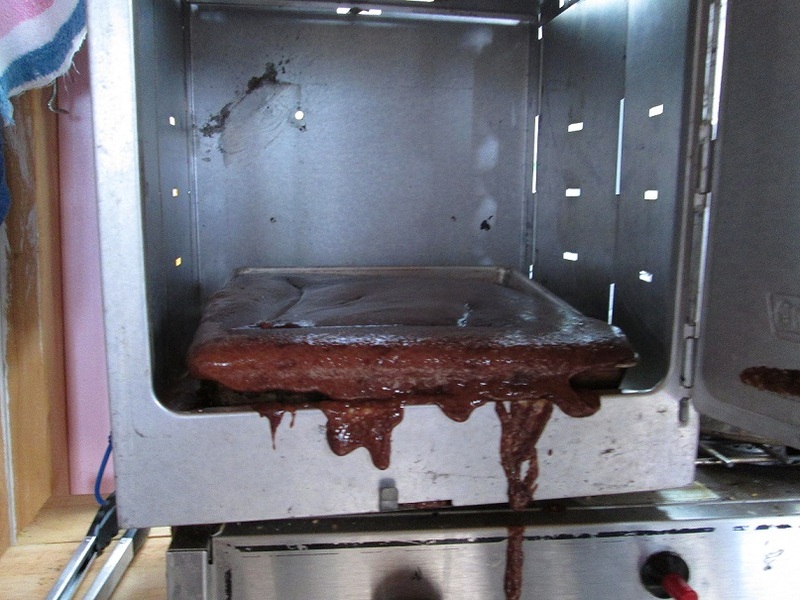 Check out the photo below for a comparison. 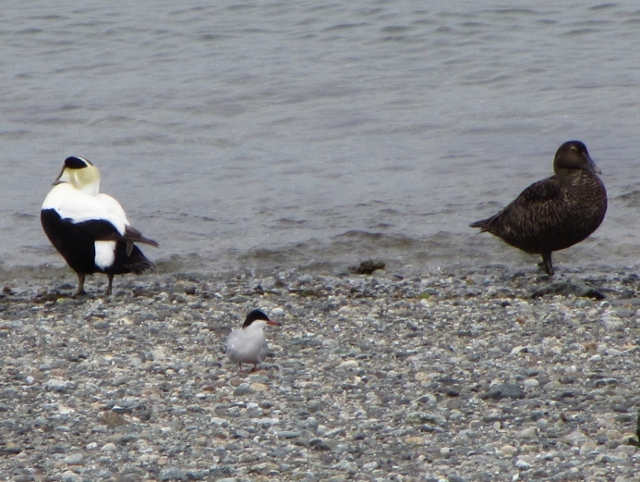 Also nesting on Trumpet are North America’s largest sea duck: the Common Eider. While the females may look like a standard brown duck, the males have flashy black and white plumage. Most often we see these large ducks paddling around with their heads under the water before they dive down for mollusks and other invertebrates. As you can see, they are quite a bit bigger than a tern! Eiders are best known for the incredibly warm down they produce – the females actually line their nests with these soft feathers. 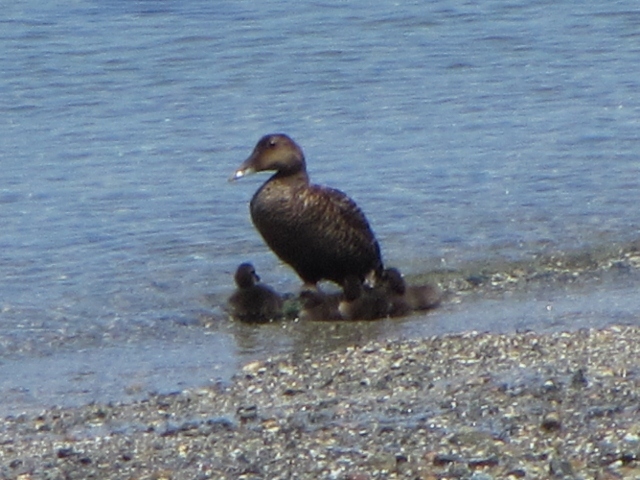 Eider ducklings take to the water the same day they hatch. Females with ducklings will gather together to form crèches, made up of several females and their young, to help protect the ducklings from predators like gulls. 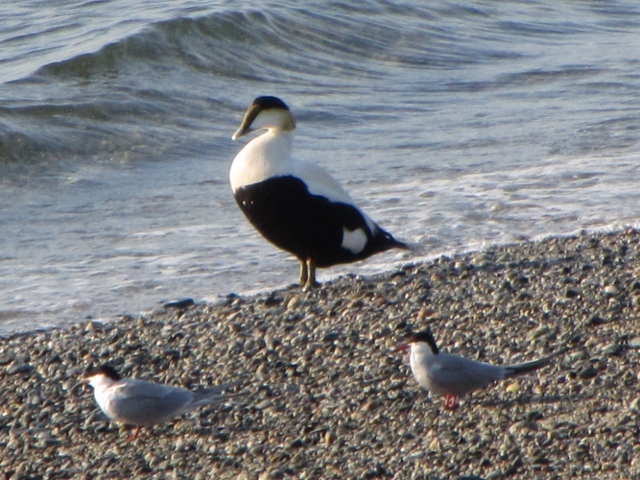 Although eiders pose no threat to our terns, they find people a bit intimidating and so prefer to nest on Trumpet. Out on West Barge, in addition to lots of Great Black-backed Gulls, we have a colony of Double-crested Cormorants. Like the eiders, the cormorants prefer to nest on human-free islands, but we see them every day in the waters around Ship. They also sometimes come to shore to gather seaweed for nesting materials, like the one flying off in the picture below. 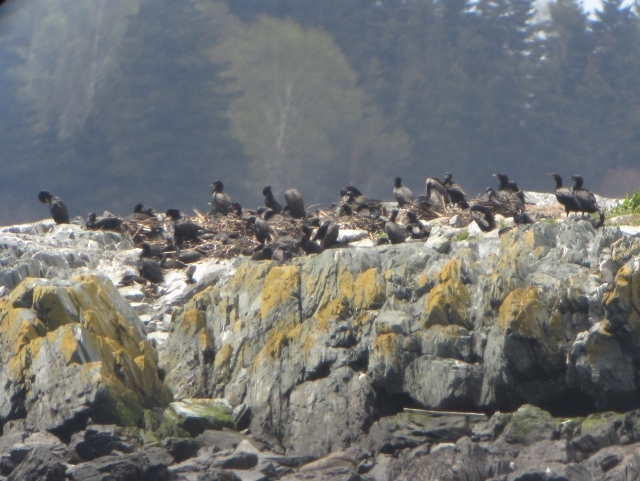 The colony on West Barge seems to be doing well – we’ve counted about 50 cormorants on the south side of the island. 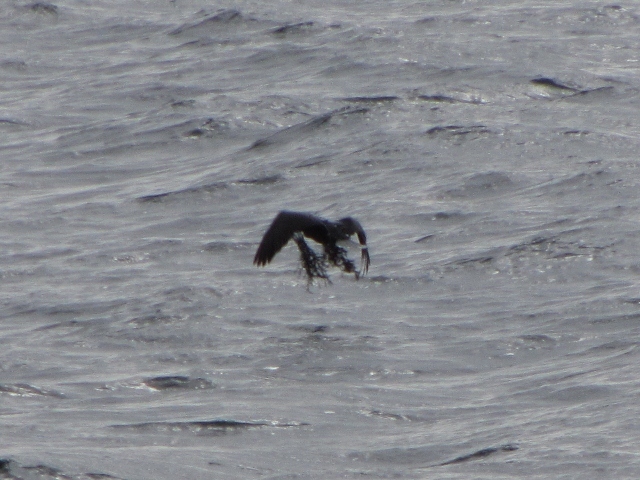 A Double-crested Cormorant flies off with some nesting material. Not all of the water birds find us so intimidating. 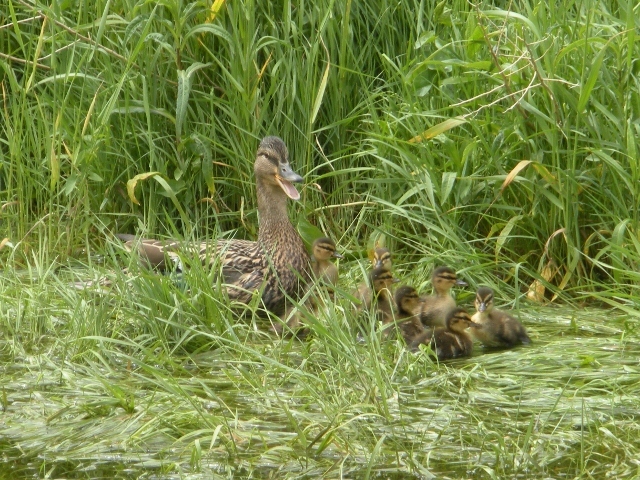 We have several Mallards on and around Ship, including a female with her ducklings. We usually see this fluffy gang paddling around in a swampy depression in the middle of the island. 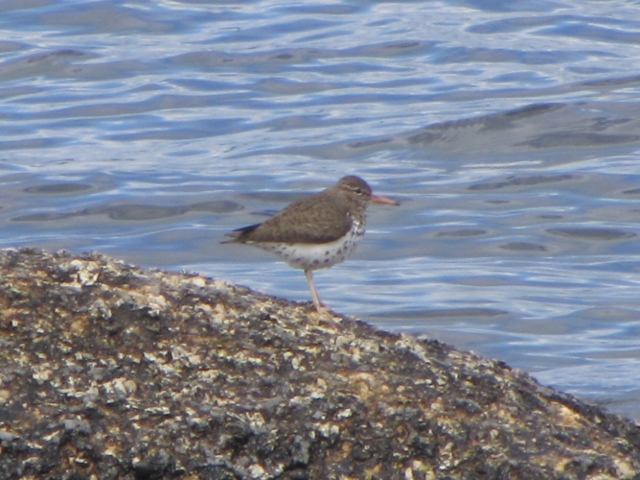 Finally, we have our beloved Spotted Sandpipers. The only shorebirds that nest on Ship Island, Spotted Sandpipers are easily identified by their “teetering” behavior: as they walk (or even when they stand), they bob their rumps up and down. The purpose of this behavior is still unknown, but it makes them easy to pick out of a crowd. 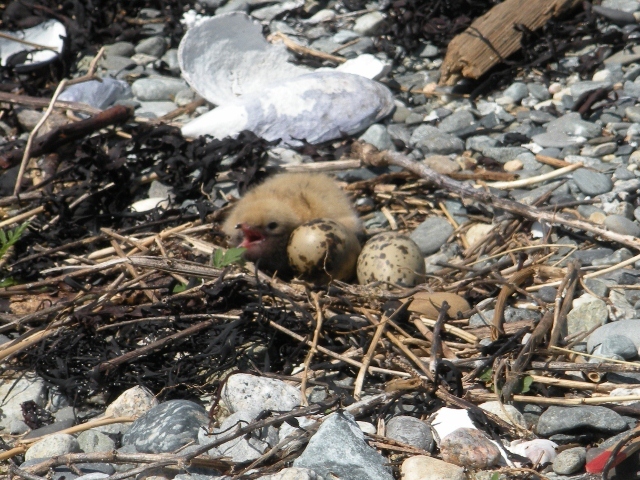 We have several pairs of these nesting on the island, and we recently spied our first chick running around on the beach. 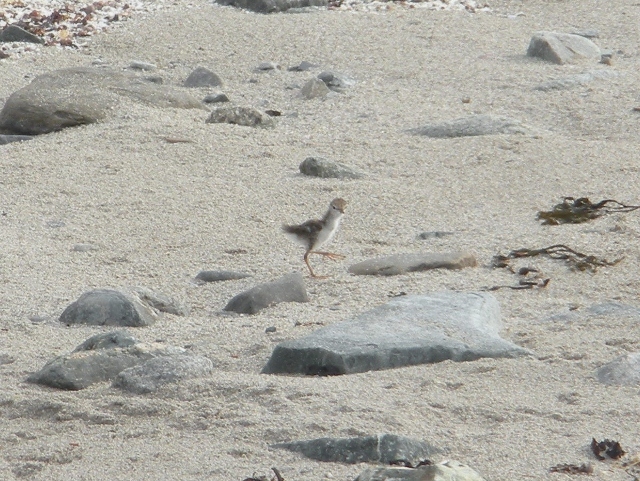 Compared to other young birds, Spotted Sandpiper chicks are quick and agile. This one was already practicing its teetering! Jill snagged a photo of him bobbing his way down the beach. Next time, the terns will be back in the spotlight with fuzzy chicks galore! While our sister restoration islands team with clouds of countless terns, the “colony” at EBI is a little more subdued. 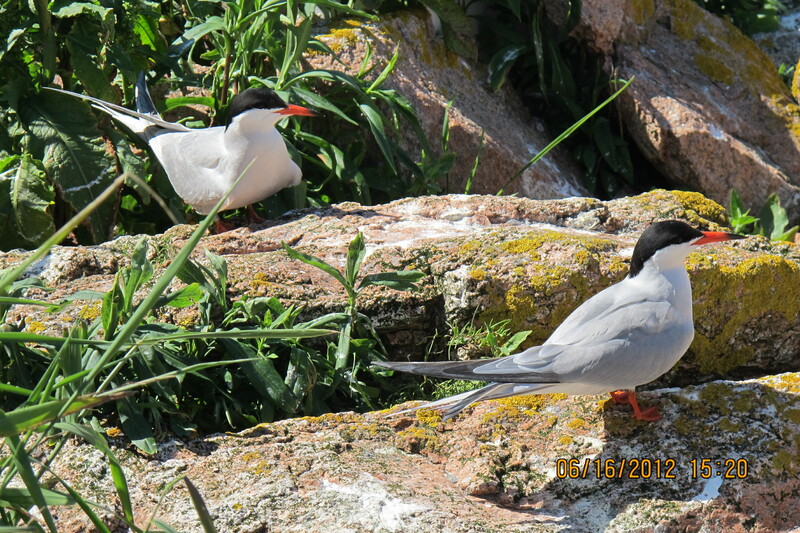 Meet Reginald Studpants McArthur, the affectionately named sole resident of our Common Tern colony. For the past few years Reggie has made his home among the harem of artificial tern decoys we install at the beginning of the season. Part of our job here on EBI is to monitor tern activity, so each morning we set up shop in the blind and prepare to watch Reggie for an hour as he goes about his daily business. He exhibits any number of behaviors such as fishing, preening, sleeping, circling the colony, chasing predators, and even attempting to court his decoys by offering them big shiny fish (sometimes while standing on their heads!). So far, no takers. 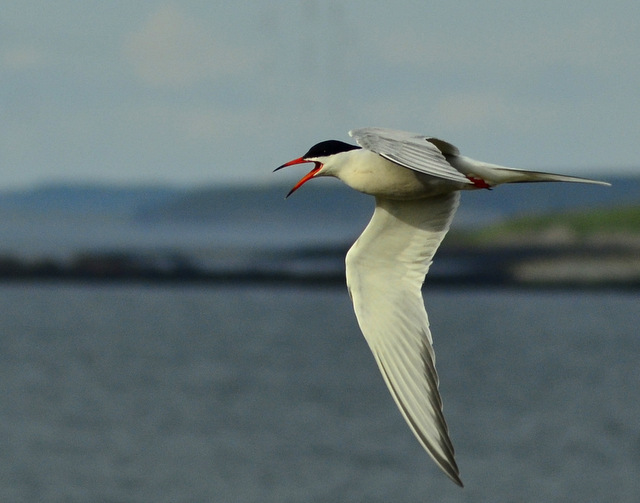 Terns, like other Larids (gulls and allies), each seem to have their own personalities as individuals. Even amongst a colony of thousands, their personalities shine through in the way they interact with others and their environment. Reggie is just the same and over the past several weeks it has been a real pleasure getting to “know” our tern as an individual. And by now he knows us, as well! When we enter the “colony” he is always right there with us, hovering above our heads or standing a few feet away, watching, calling, circling, and making sure we don’t harm his “friends,” the decoys. He trusts us and simply observes, curious about our activities but knowing we intend no harm. Novel objects, such as my backpack left behind on a rock, he seems to enjoy, hovering over them curiously. There is one thing he does not tolerate, however, and that is the Eagle who visits us on occasional forays from neighboring Green Island. Eagles are destructive predators of seabirds and will eat anything. Terns exhibit a mobbing behavior to scare away such predators and Reggie is no different. To protect his colony of decoys he takes on the perilous task of chasing away the Eagle all by himself, diving, screaming, and doing everything in his power to chase the Eagle all the way back to Green Island before he returns, triumphant, to strut amongst his decoys as if congratulations were in order. And indeed they are, for one small tern against a giant Eagle is no meager feat! You go, Reggie. 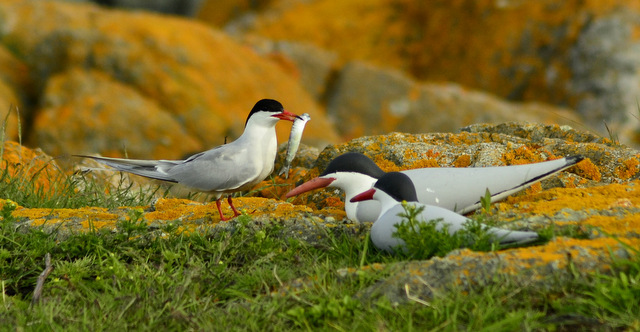 Terns, Puffins, Razorbills, Guillemots, Petrels, Gulls as well as other birds we see at various times nest on the refuge islands during the late spring through early fall; but what about other species that inhabit the islands? We see a large array of sea birds, raptors, song birds, fish that the birds catch, seals loafing on the intertidal area and various invertebrates such as butterflies, bees and dragonflies. This particular post is written in hopes of relaying some information on the butterflies of Petit Manan Island. Thus far, I have come across six different butterfly species that include: the American Copper, Question Mark, Red Admiral, American Lady, Painted Lady and the Black Swallowtail. 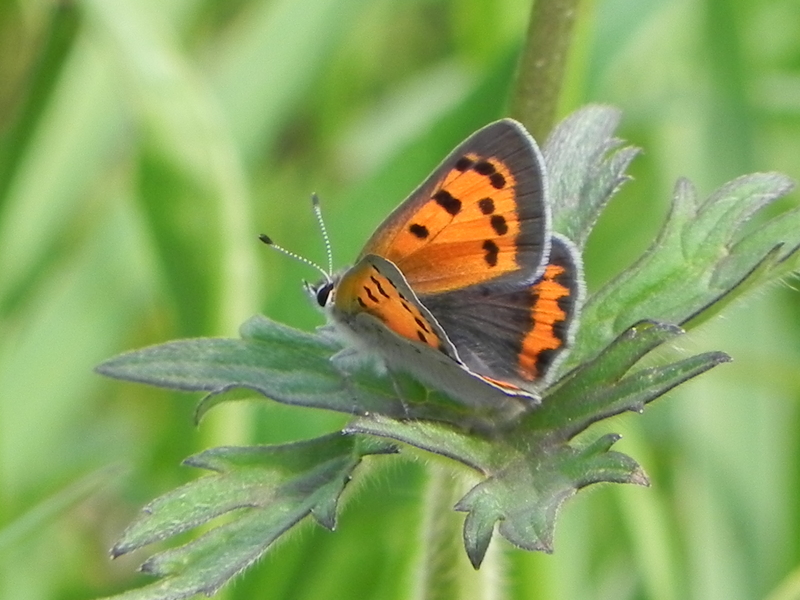 The American Copper habituates disturbed open landscapes such as fields and has been known to eat from field sorrel, which is found in abundance on Petit Manan. Question Mark is indeed the name of this butterfly. 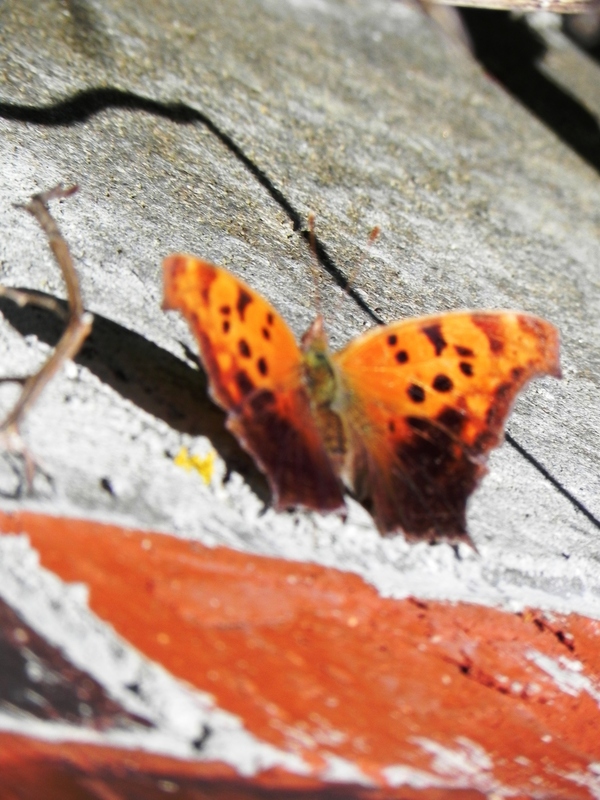 The Question Mark habituates open habitats as well as woodlands and has been known to eat from Nettles and Hackberry. Petit Manan has one single shrub on the entire island, so it is unlikely that it was seen for our lush woodlands; however, we do in fact have stinging nettles growing in hidden locations, waiting to catch our pant legs when possible. The Red Admiral habituates open landscapes with flowers which can also include moist meadows and fields and has been known to eat from Nettles as well. 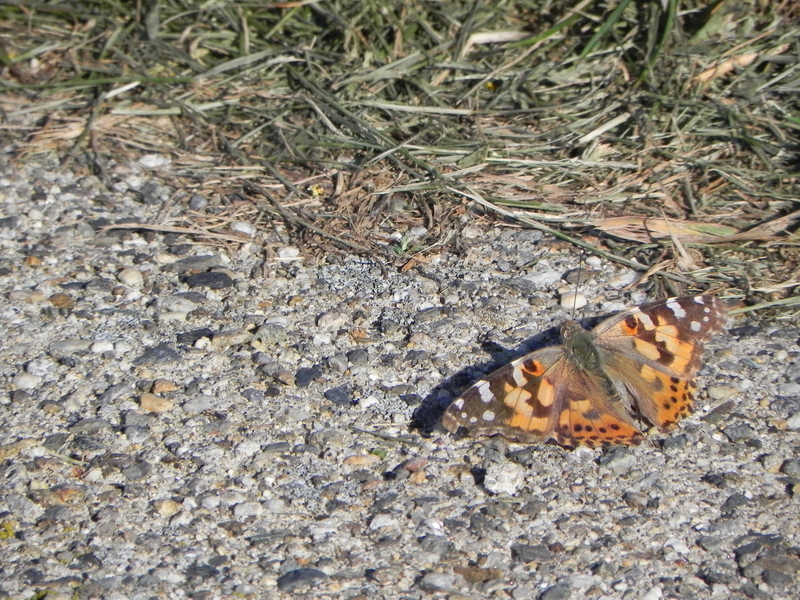 The American Lady habituates open landscapes such as fields and meadows and has been known to eat from pearly Everlastings as well as other Compositae. The Painted Lady(above picture) looks very similar to the American Lady; however, Painted Ladys do not have the two large eyes on their inner bottom wings as the Amercan Ladys do. The Painted Lady habituates open habitats and has been known to eat from Thistles. The Black Swallowtail habituates open landscapes such as meadows, fields, tidal marshes and lawns; while have been known to eat from parsleys, fennel and carrots. Whether the butterflies are just flying by or have a reason to stay is something I wonder when I see them flying around. The landscape of Petit Manan Island is roughly open grasslands with patches of flowers found throughout. In this matter, it is not a surprise to have seen these butterflies dawdling about. 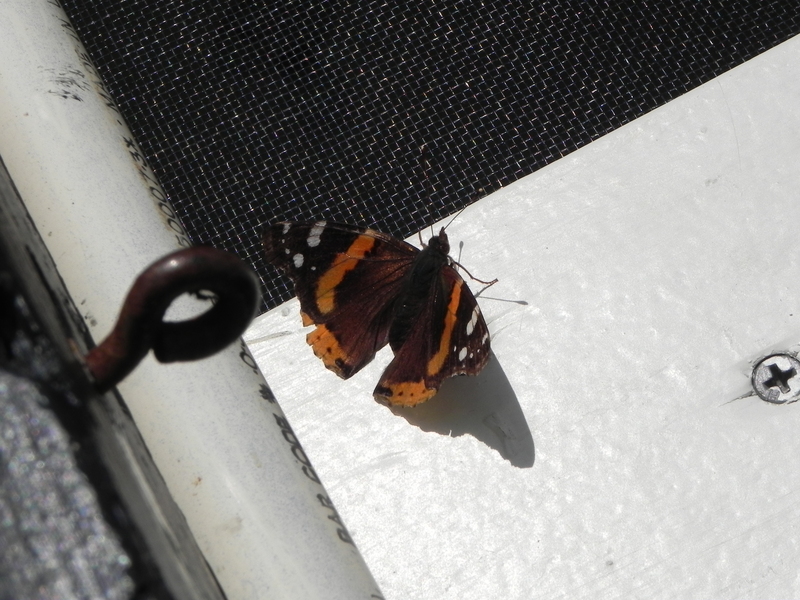 Butterflies have very delicate structures and will likely not come out of hiding unless it is a beautiful day. I consider them a little gift from nature that helps brighten your day after a period of dreariness. These invertebrates have four distinct stages they go through in their life: egg, caterpillar, pupa and adult. A question I myself had at one point was where do they go during the cold winter months? The female butterflies lay their eggs from the beginning through the end of the summertime, during this time the eggs hatch into caterpillars where they steadily grow in size until they become a pupa. Some of the eggs don’t hatch during that season while some of the pupas go into a dormant state which both stages will remain in until spring time rolls around where caterpillars and beautiful butterflies will emerge to welcome the vibrant winter free landscapes. Something that has always proved true is, seeing a butterfly flying around is a sure sign of a perfect day.